Remember when I was pretending to be a purse model? (If you don't click here to refresh your memory). Well it turns out that Miche thought I was such a great model that they wanted to do something nice for me!! They sent me a freakin cute new purse liner and donated a few things to help my mom and I raise money for cancer research so we can ride with the Huntsman Heroes in the 80 mile bike ride we like to do together. Miche is an awesome company that has three different designs all supporting cancer research. It is called their "Hope" line and all the purses say "Hope" and other inspiring things. They did not ask me to do this post nor did the tell me I have to write a good review about them, I am doing it of my own free will. The ladies that worked with my mom and I are so kind and generous and really made me feel special. Here are my incredible model skills at work yet again. These pics aren't as good or fun but there was no one home to be the photographer and its hard to be a model AND a photographer all at once. I tried to get the dog to do it but he wanted to be in the pictures. I had to crop him out of every one haha. There you have it :) But back to the bags Miche donated to us. We (meaning my mom and I) want to give away the set (pictured below) to the first person who donates $500. Remember this is completely tax deductible and goes directly to the Huntsman Cancer Institute. However, if no one donates that much, we will have a drawing for it. If you donate at least $200 you will be entered into the drawing. My mom and I have committed to raising a total of $1500 between the two of us so we really need your help! If you know of any companies or anybody in the community that usually donates to cancer research let them know about our link so that we can get credit for their donation! If we fail to raise the $1500 we won't be able to do the Little Red 80 mile bike ride at all this year :( I would be really sad. After doing it last year the day after I found out I had cancer, I am really looking forward to doing it this year hopefully with a little more energy and on a better note :) This really means a lot to me so help spread the word!! All this is included in the gift set. 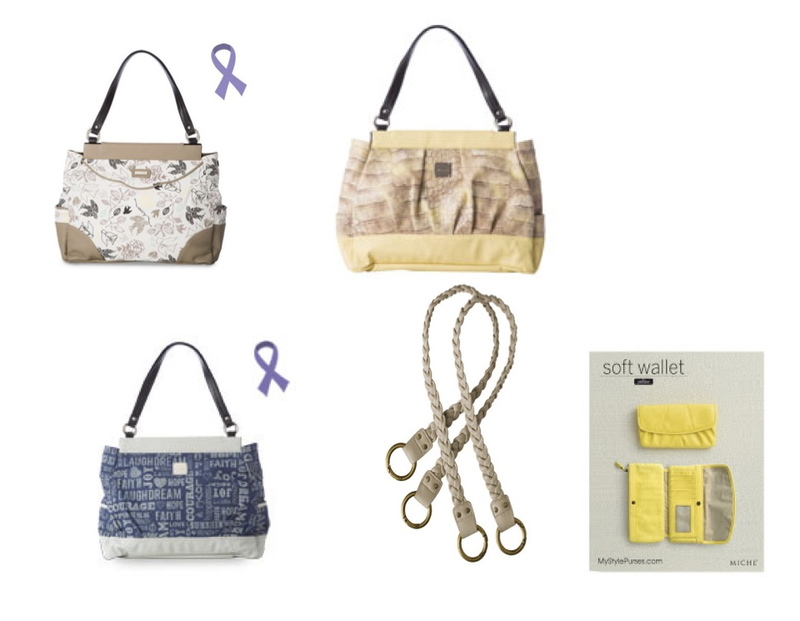 Three purses, a set of interchangeable handles and a super cute wallet that I wish I could keep. All you have to do is go to this link http://littlered.kintera.org/womenofsteal and donate. Every dollar helps! So if you only have one dollar to spare, do it. It's for a good cause. I would know. Because there is a lot about ovarian cancer that they don't know yet and I need them to hurry and find it out! Last year 2 days after I found out I had cancer. You've seen this picture before I'm sure. P.S. I am doing really well. Today I got to run with my former teammates and I was even able to keep up with them! Yes it was their "recovery" run and I was not recovering, but it still felt awesome and made me really happy! I love my hair now that it looks like a cute pixie cut and I am LOVING the sunshine. Also I happen to be going into a situation in a few days in which I might get to see a lot of monkeys. Holy crap I can't even contain my excitement. If they jump on me and crawl on me and I get to play with them I might just pee my pants because I will be so happy. But that is in a few days to come and I will definitely be bragging about it here! Oh and it was my 3 year anniversary on March 12! Can't believe I made it that long. But seriously. It was a rough third year for us. It has been AGES since I wrote a blog post. I know. I'm sorry. It's like my journal, I am sooooo good at it for months and months and then all the sudden I fall out of the habit and can't get back into it. Mostly I just got busy and then when I wanted to write about something I didn't have pictures for it so I thought it'd be too boring to write about. But this blog is my journal now and I know I'm going to want to write things down so I can read back over them later or maybe, just maybe, my future kids might want to read it. Who knows. I got a job about 2 weeks ago! I only work Monday, Wedneday and Friday but I feel so busy and I haven't had time to write. Okay I obviously have all day on Tuesday or Thursday or Saturday or Sunday but......I feel like I have been busy haha. I am working as a physical therapy aide at Performance Rehab Clinic in Draper of 12300 S. I work from 7:30am to 2:30 or 3pm. Then I change into my running clothes and run from work and then I get home around 4:30ish. I have been having a ton of fun and I really am enjoying what I do. I definitely don't do it for the pay...but it is great experience and I like it which is important. I wrote at the beginning of February that I was finally feeling back to normal......I must have forgotten what "normal" felt like because now at the beginning of March I am realizing that even just a month ago I was far from normal! I cannot believe how much different I feel now! I didn't realize it until I went skiing yesterday and I was able to ski all day, hard, without needing a break every 5 minutes or feeling like I was going to die. I didn't remember that you shouldn't feel like you are going to collapse after one really hard run. I didn't remember what it felt like to be able to breathe without feeling sick to my stomach. I didn't remember that when I go running I shouldn't feel like I'm going to pass out after 15 minutes. All of these things I am able to do lately and it is so incredible!!!!!!!!!!!! I feel AMAZING. I can wake up at 6:30 in the morning and function all day. I can stay up till midnight without becoming a zombie (I mean I'm still an early to bed kind of gal but if needed, I can stay up). I am back up to running 5 1/2 to 6 1/2 miles a day. Two Saturdays ago I ran for 7 miles! And I did 41 minutes without stopping. On Friday I ran the last three miles of my six mile run at an under 8 min/mile pace :) I seriously did not realize how tired I had been the past 8 months of my life. Maybe even longer. I think the cancer in me was making me fatigued even before I started chemo. I am so incredibly grateful every single day for my health and my body and my energy. I sometimes want to cry because I feel SO much better I can't even comprehend it. My hair is finally a cute length. I can style it cute and in the next month or so I can probably even get a hair cut! Never thought I'd be excited to be able to have a hair cut haha. My brother Josh has been in the MTC for 12 days now. He is really enjoying it and sounds so happy. I've only heard from him twice but both times he just sounded like he was enjoying it a lot. He got to give his first priesthood blessing this last week and he got to use my cancer story to help an investigator he was teaching :) I am glad he's doing well. He seems to really be flourishing. He leaves for the field in California on Tuesday. My sister-in-law leaves for her mission on Wednesday. SO crazy. She's really excited too. Okay I have like 3 more posts I need to write this week so come back for more updates :) Sorry this post was so much talk and so little pictures, not as much fun to read, I know, but it's stuff I gotta say, at least for myself. P.S. That last sentence had four commas. Pretty sure any English teacher would kill me.